It was a day that began in celebration and shouts of Hosanna! Join our children in a special time in worship with this community of faithful people who come in praise! Hold your palm branch, wave it and sing to the One who came for us all. What was it like on that last night that Jesus gathered with his disciples, teaching them, serving them, and giving them a new commandment...to Love One Another. With a short drama to help us experience it for ourselves, and with a sharing of Holy Communion, Jesus Christ invites all to his table of grace. A Tenebrae Service, one that moves through scripture readings and beautiful music from a place of light to darkness, as the world comes face to face with the crucifixion of our Lord. The St. Paul's Sanctuary Choir leads us in contemplation through the shadows of betrayal, agony, loneliness, desertion, accusation, mockery, and death. The Lord is risen indeed! That's reason to celebrate in hope! We witness to the miracle of life in Christ! Claim this hope of new life even out of death itself, resurrection out of endings. Celebrate a new creation! 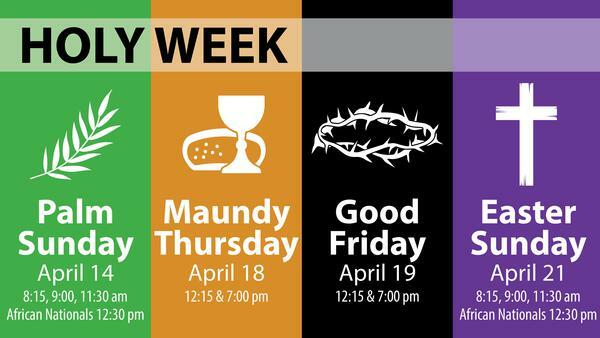 Easter is for everyone, and we invite you and your friends and family to join as we celebrate the risen Lord Jesus! Easter service is an inspirational experience where everyone will feel welcomed. 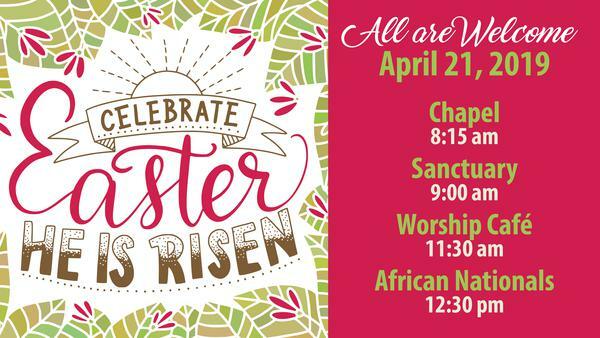 Join us on April 21, 2019 for worship: 8:15 am Chapel; 9:00 am Sanctuary; 11:30 am Worship Cafe; 12:30 pm African Nationals.